8:20am update: Some times timing is everything! A quote from today's New York Times (after a week, viewing may require membership) about blogs covering restaurants, "Bloggers are now a very important part of the media landscape because a lot of diners get their information from them." Congratulations to all the NYC bloggers featured in the story. 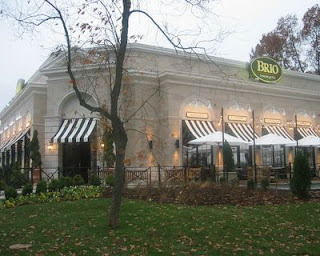 Now here's the latest St. Louis restaurant review ... Brio's. When Brio’s Tuscan Grille first opened, it was standing room only and three people deep at the bar with an hour-long wait to be seated. My Dear Husband and I tried to get reservations but the only times available were 4:30 pm or 9:45 pm. Since my ‘beauty bedtime’ is 9:30, we passed. Finally, after the restaurant’s first anniversary, we hoped that the lemmings had descended upon another favorite spot and sure enough, secured a table for four right in the middle of the restaurant. We quickly learned to request a table on either the north or south wall where one can carry on a conversation – the restaurant is still very popular and the bar is still very lively. Mine is a lifelong search for the best fried calamari and I have found it at Brio’s so now can stop looking! Their appetizer portion of Calamari Fritto Misto ($9.50) was comprised of abundant tender rings and tentacles of marinated, coated, gently flash-fried calamari, served with aioli sauce -– plus coated and flash-fried pepperoncini, what a delightful surprise! If you like calamari, don’t miss it. The Bistecca Insalata ($4.95) was a wedge of iceberg lettuce, Gorgonzola cheese, bacon crumbles, Roma tomatoes and a creamy Parmesan dressing; it served two easily. My Dear Husband and I agreed that it shouldn’t really count as a salad or vegetable nor a heart-healthy choice since iceberg lettuce has little green and no nutritional value; the cheese and dressing were decadently rich, albeit guiltily delicious. The Zuppa Del Giorno ($4.95) was cream of mushroom, heavy on the cream, light on the mushrooms and flavor, also not a heart healthy choice. Better to stick with the good Caesar Salad ($4.95), dressing on the side. Now on to the entrées. Under Specialita (House Specialties), my Dear Husband and I both ordered the Fresh Fish Del Giorno ($22.95): fresh lemon sole (that our young waitress described being “like a mild tilapia”) stuffed with crab and served on a bed of perfectly prepared mashed potatoes (without garlic, hallelujah!) surrounded by a ring of fabulous crunchy grilled asparagus pieces. At first, the appearance of the white, rolled, unbreaded fish surprised us. But one taste and my eyes rolled backwards while I swooned in delight. Great crab stuffing; light, light on the sauce. Once again, we should’ve split a single order since we each took home half our orders. Happily, they provided a terrific dinner two nights later. Also consumed at our table was the amazing Whole Oak Roasted Chicken ($17.95) with lemon-pepper marinade, mashed potatoes, and roasted vegetables ... and I do mean WHOLE chicken. Be forewarned: do not attempt to eat the entire serving or you’ll be stuffed waaaay beyond comfort. Take half of the tender and moist chicken with crispy skin (if you still eat fattening and unhealthy skin) home and enjoy another generous meal. The Lasagna Bolognese Al Forno ($13.95) was deep, hot, filling, and also enough for two. Under Pasta, the Garganelli Carbonara ($14.95) turned out to be a poor choice: the wood-grilled chicken, crisp bacon, Parmesan-Reggiano and sautéed spinach was a good-tasting combination, but the sauce was too rich and on the gummy side. The better tasting – and more healthful - choice was the Pasta Brio ($12.95): wood-grilled chicken, seared mushrooms, and roasted red pepper sauce, excellent, and again, enough for two. Our waitress somehow discovered it was my birthday and surprised us with a wonderful dessert of gelato (Mocha Cioccolata and Alla Vaniglia) topped with a lit candle, which my tablemates used as an excuse to serenade me with an Italian version of Happy Birthday sung 'uno duettino'. Beverages throughout the evening were a glass each of: Sketchbook’s adequate Cabernet Sauvignon (California - $10.95); Hope Estate’s fabulous Shiraz The Ripper (Australia - $9.95); Acina’s adequate Chianti ($6.95); and a cup of regular coffee - a dark-roast Italian bean that was deep and rich and yummy. Reservations are limited. Carry-out is available seven days a week for lunch and dinner. For seasons other than winter, Brio has a lovely Italian style terrace (with big heaters for cool Missouri evenings) for dining alfresco. After viewing their brunch menu online, I’m going there next time for brunch! The food was well-worth waiting a year for. Go hungry, mangia, and enjoy. The Foodie Patootie previously reviewed Sofia Bistro. This place is a chain; we have them here in the D.C. area. Just tried it last weekend. Not impressed. It's basically a gussied-up Olive Garden. Any restaurant that serves a salad with those black-dyed, plastic-flavored olives that come from a can is not fine dining. Sounds nice..and worth wading through the menu for the outstanding dishes. We'll have to head over there the next time we take a weekender in St. Louis. Thanks for the review! always right: You're right - it is a chain. And in St. Louis it's also a popular restaurant. I also agree with you: if I was ever served one of those black rubbery things passed off as an olive, I certainly would've mentioned it -and not favorably. Thanks for your comment. Glenna - I hope you have a nice meal there when you get to STL. Thanks for writing. I went back to Brio's *late* one Sunday evening a couple of weeks ago, ordered my fav Calamari, and guess what??? They were nowhere near the same as last time: no crunch on the outside, and a bit mushy on the inside - so no longer my favorite in the city. Hmmmm... I suppose any restaurant's food may be different on any given day of the week, time of day, or perhaps who's cooking in the kitchen...?? ?